Taking its rightful place in the MPV market is the Toyota Verso, this 5-7 seater family car displays all the characteristics required to keep a large family happy. The versatile interior manages to house 7 seats including the 2 rear pop up seats. The Verso come’s in 4 trim levels from Active to Excel. In terms of overall size the Verso is one of the smallest 7 seaters on sale however the interior still feels suitably spacious. Engine choice is simple with 4 on offer combining petrol or diesel and manual or automatic. The quickest is the 1.8 litre petrol which goes from 0-62mph in just 11.1 seconds. The 1.6 litre diesel is the most economical returning up to 62.7mpg. There’s combinations that offer both however a compromise on one figure will be required. The ride is stiff so minimal rolling in the corners and despite its size the Verso is a very easy car to drive. Inside the Toyota Verso is a well-built cabin. More spacious then the exterior size suggests. There’s 5 seats for adults and 2 in the rear that can accommodate children easily. Practicality for the driver is the main focus for the dashboard with easy to access dials and controls. The kit included as standard is impressive with the much celebrated Toyota Touch 2 Infotainment screen being the central focus. Follow me home lights, 4 speakers, air conditioning, front fog lights and ISOFIX seat fixing all come as standard. Boot space is listed at 155 litres with all 7 seats up however fold down the back row of seats and you get 440 litres. 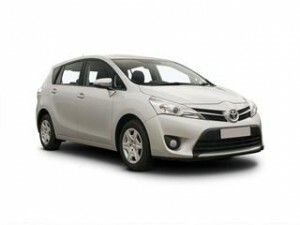 Here at Coast2Coast Cars we pride ourselves being able to find you the latest deals on a new Toyota Verso. We like to make it as much fun to buy as it is to drive too. We are in touch daily with a nationwide portfolio of dealers who all have options to save you hundreds maybe thousands of pounds on the price of a new Verso. It takes a few minutes to get your discounted price with no obligation. Speak to us also about how to finance your car, we can help subject to status.